This report is published weekly on EcPoFi. 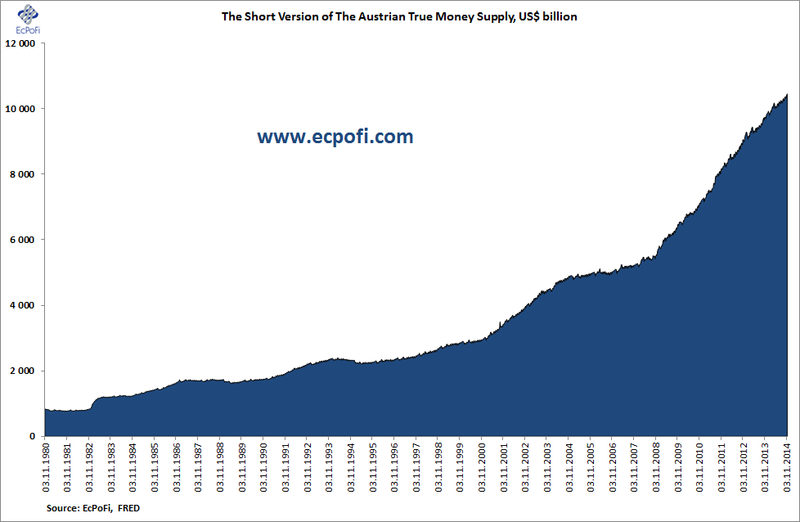 The short version of the Austrian True Money SupplyÂ for the U.S. increased 0.26% on last week for the week ending 17Â November 2014. At $10.4593 trillion, a new high for the third consecutive week,Â the money supply is now up $576.0 billion, or 5.83%, year to date. The money supply has now increased $5.0370 trillion, or 92.89%, since Lehman Brothers filed for bankruptcy on 15 September 2008. The 1-year growth rate in the money supply of 7.29% for the week was unchanged from last week. The growth rate still remains lower than the long term average of 8.29% and is also substantially lower than it was during the 2009 to 2013 period. 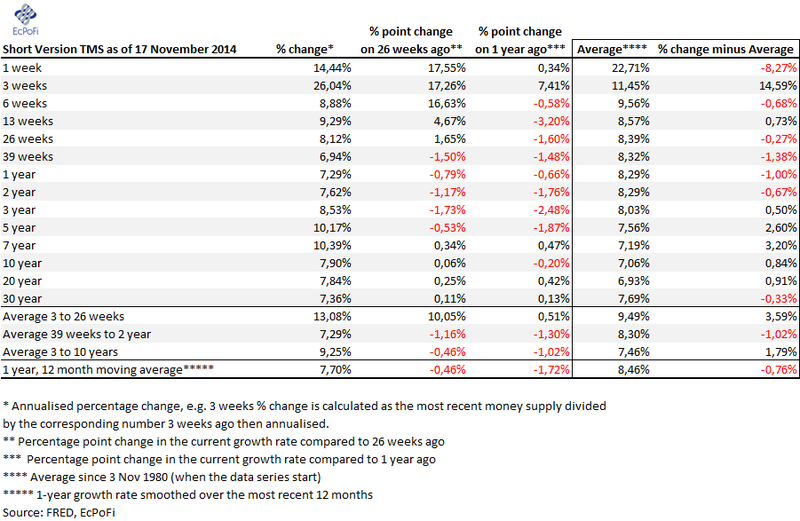 The growth rate however fell further compared to the same week last year, dropping 66 basis points (compared to 38 basis points last week). In the U.S. (and most other countries), only the central bank and banks have the ability to create money. 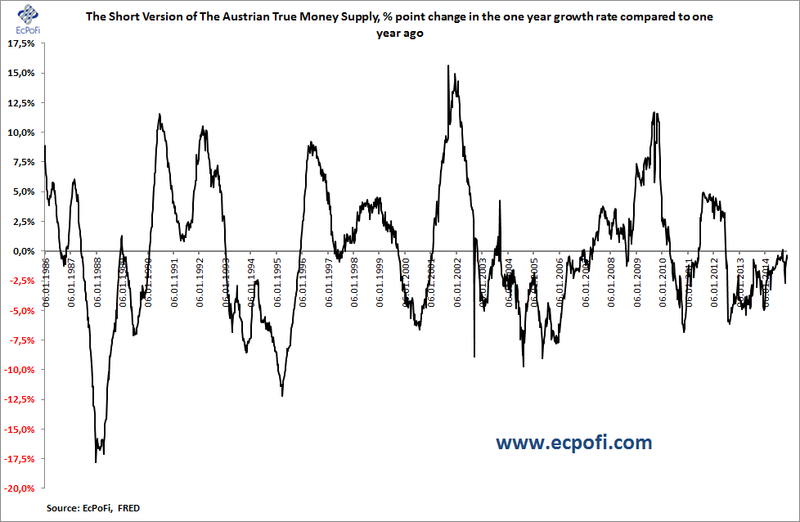 The Fed has been the primary driver of money supply since the Lehman bust up to especially the beginning of this year. The money supply increases as a result of Fed asset purchases when it buys securities from the non-bank public and the government. 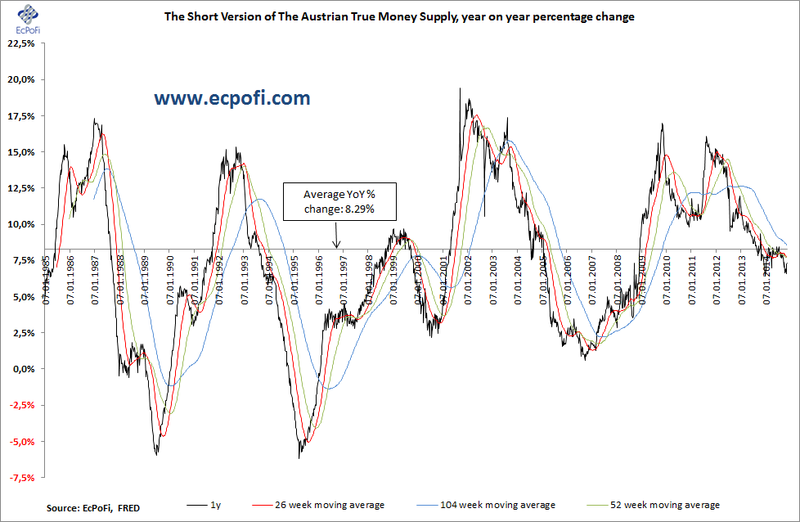 Note that there is no direct effect on the money supply when the Fed buys securities from banks. Instead, such purchases increases bank reserves and the monetary base (which consists of bank reserves and notes & coins). 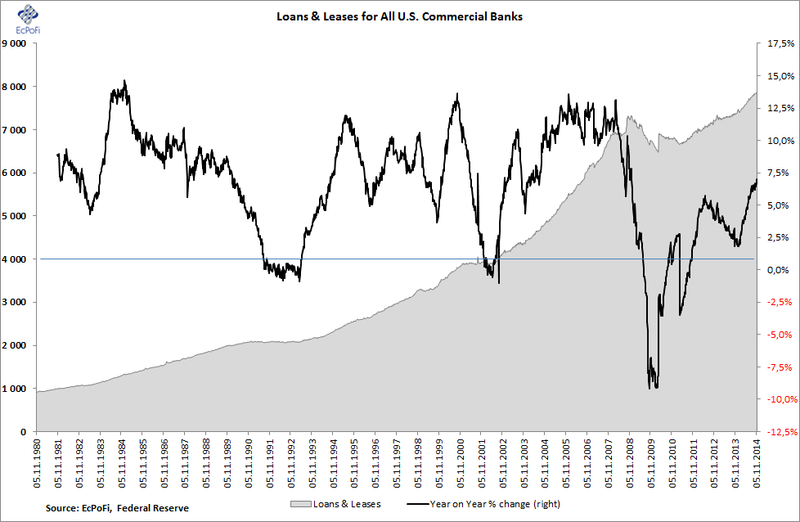 As bank reserves increase, this does however put banks in a better position to lend. Fed asset purchases from banks hence has an indirect effect on the money supply as it will either lead to increased money supply some time in the future or lead to a lesser decline in lending and hence the money supply than would otherwise be the case. As I’ve written about a number of times during most of this year, it is an all-important factor that banks increase bank credit (which consists mostly of securities and loans) when the Fed reduces its asset purchases (e.g.Â here). This shift (from the Fed to the banks) in which institution creates money to keep the money supply growth rate up is in my opinion perhaps the most important economic event this year. So far, the banks have indeed expanded bank credit and this explains why the money supply growth rate has been holding up reasonably well in recent months despite the Fed taper and the end of QE3. Bank credit has not only expanded this year, it has shut up quite significantly. After plunging toward 1% at the end of 2013, the year on year growth rate has since increased to 6.85%. Part of this increase has been driven by lower interest rates as some securities forming part of bank credit is marked-to-market. But Loans & Leases (L&L), which currently makes up about 73% of bank credit, has really shut up this year and hence explains the majority of the increase in bank credit. During the last year L&L increased 6.99% and is now up 5.68%, or $423.3 billion, this year alone. 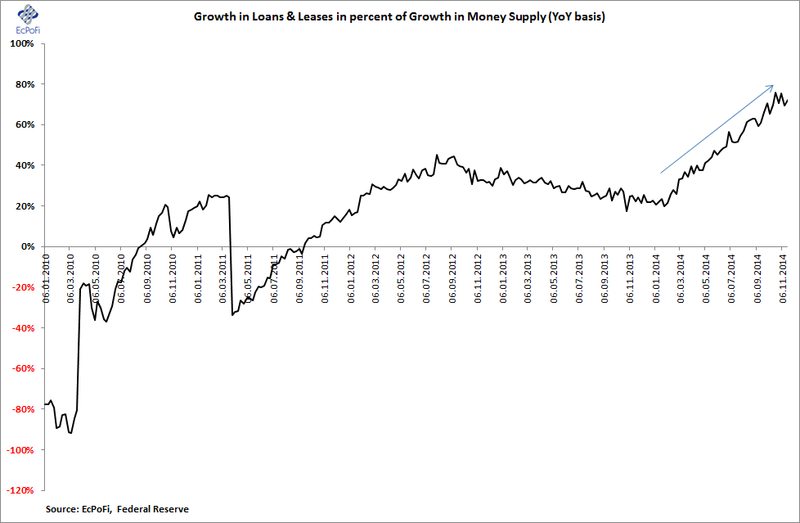 As the money supply is up $576.0 billion this year, about 73.5% of this growth has come from the increase in L&L. This represents a dramatic increase compared to the 2010 to 2013 period when the Fed through monetizing surging government debt (created by massive deficit spending) was the primary driver of money supply growth. Assuming QE4 is not on the agenda to be implemented soon (it is a backup plan of the Fed for sure as saving banks is what it does for a living), the question now becomes to what extent banks can create ever new money. In terms of reserves, there are currently few theoretical limits to how much credit banks can extend as reserve requirements remain negligent and as bank reserves are by far the highest they have ever been in the history of fractional reserve banking (here). There are practical limits however to how much credit banks can expand their balance sheets: the equity to total asset ratio remains just as low as it was during the banking crisis in 2008, the demand for loans and qualified borrowers are not unlimited and there is increased pressure on banks to increase capital and become more solid (e.g. Basel III, though the committee is largely fiddling with ridiculously small capital increases which looks more like an attention-diverter than an ambitious attempt to change banking for the better). Finally, and I do believe this is important, based on my own experience there appears to be increased awareness in the public domain about the fragility of fractional reserve banking and how that causes economic “instability” and artificial economic booms and very real busts. Even Martin Wolf at the FT is calling for more bank capital (e.g.Â here) and Anat Admati, a finance and economics professor at Stanford, appears to gain traction in the mainstream media about her calls for a substantial increase in bank capital ratios (toward 30% instead of around 10% if memory serves me right). Follow the money supply is my advice for investors, money managers and anyone that does not want to be caught off-guard by this money-printing madness. And do watch banks’ balance sheets very carefully, banks are after all now once again running the U.S. economy. As for politicians and policy makers, I can only strongly advice to learn about the damning effects of an elastic money supply. It is great to see that Steve Baker, MP has started the ball rolling in the UK (here, start watching from 11:18:20). Time for other politicians to follow if they really do care about their electorate and the economies they all live in.